Ever since Joan Van Dyke, a former Mount Gallitzin Academy student, opened a dance studio in 1984, she has dreamed of creating an original ballet about MGA in honor of the Sisters of St. Joseph who nurtured her faith and performing arts career. Joan, founder and artistic director of Van Dyke & Company, is delighted to announce that “Lace, Ecole de Vie,” will debut on April 21 at 7 p.m. in the Jackson Theater at the Punxsutawney Community Center. The ballet, she says, is a tribute to the Sisters for their unwavering dedication to their students and for setting the standard for all women in their professions. 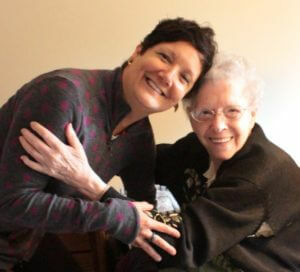 Joan, who is also an Associate Professor of Dance at Indiana University of Pennsylvania, recently re-connected in Baden with a few of her former teachers, including Sister Ruth Sattler and Sister Jean Stoltz. In conversation, Joan learned of Sister Ruth’s collection of compositions that she has written over the years. As plans for the ballet unfolded, Joan shared Sister Ruth’s compositions with the musical collaborator on the ballet and he creatively intertwined Sister’s music in most of the ballet pieces. As a student, Joan was captivated by the beauty of the Chapel and what transpired in the sacred place. “The gorgeous chapel set the stage for a joyous opportunity to communicate with the Lord with the Sisters leading the way. The Mass was completely interactive, with everyone singing and responding energetically,” she says. The performance features MGA scenes from the first day of school, graduation, French and art lessons, the Chapel, cafeteria and auditorium. Tickets for the April 21 ballet are $13 for general seating, $15 for reserved, and $25 for balcony. For more information, please call 814-938-8434 or email at vandykeco@gmail.com.